City clerk Devon Reid at a City Council meeting. Reid appeared in court on Tuesday after his arrest for driving on a suspended license in February. 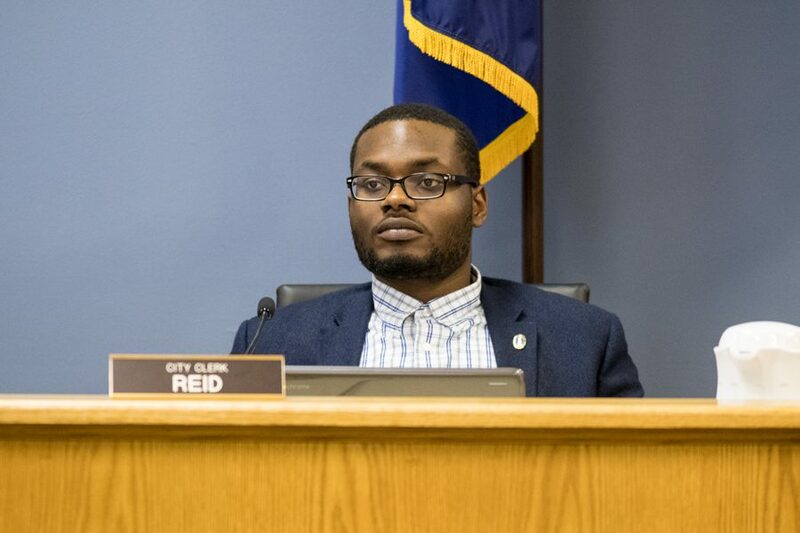 City clerk Devon Reid appeared in court Tuesday after he was arrested in February in connection with driving on a suspended license and ticketed for a traffic violation. He was also issued a city ordinance ticket for possession of marijuana. The judge at Cook County Circuit Court in Skokie delayed the case until April 6, and Reid told the Chicago Tribune his license remains suspended. It was initially suspended in 2013 for driving without insurance, and he told the Tribune he did not renew it because he does not drive often. He added that he now wants to revalidate his license. He appeared in court to answer to the charge for driving on a suspended license. Reid said he believes the misdemeanor charge will be dismissed at the next court date, the Tribune reported. Officers discovered Reid was driving on a suspended license when they pulled him over in the 9400 block of McCormick Boulevard in Skokie on Feb. 13 after failing to signal a turn in the 2400 block of Emerson Street, Evanston police Cmdr. Ryan Glew told The Daily in February. Glew said arresting a person driving on a suspended license is routine procedure for officers. After the arrest, officers searched Reid’s vehicle and found less than 10 grams of marijuana, Glew said. Reid told the Tribune there were “some sprinkles” of marijuana in a bag. Reid said he was driving his roommate’s car to the hospital to take his neighbor’s children home, according to the Tribune.